Corporate finance lawyers advise companies on all aspects of the buying and selling of whole businesses or business assets. Whether negotiating a merger agreement, acquisition, rendering a fair opinion, issuing securities or taking an IPO public, Lawyers without the basics of corporate finance are at a disadvantage. This training aims to provide corporate lawyers with the essential tools to work with financial experts and corporate clients. 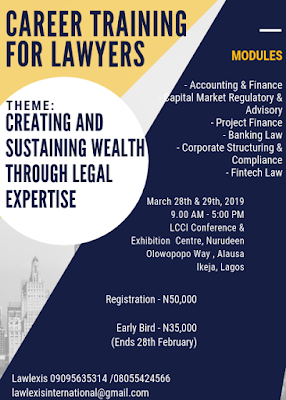 For contact, registration and sponsorship details, Please contact Lawlexis on 09095635314; 08055424566. Note that all Payment confirmation and Delegate Information should be sent to lawlexisinternational@gmail.com.